In this blog post, we describe Chrysaor, a newly discovered family of spyware that was used in a targeted attack on a small number of Android devices, and how investigations like this help Google protect Android users from a variety of threats. Chrysaor is spyware believed to be created by NSO Group Technologies, specializing in the creation and sale of software and infrastructure for targeted attacks. Chrysaor is believed to be related to the Pegasus spyware that was first identified on iOS and analyzed by Citizen Lab and Lookout. Late last year, after receiving a list of suspicious package names from Lookout, we discovered that a few dozen Android devices may have installed an application related to Pegasus, which we named Chrysaor. Although the applications were never available in Google Play, we immediately identified the scope of the problem by using Verify Apps. We gathered information from affected devices, and concurrently, attempted to acquire Chrysaor apps to better understand its impact on users. We’ve contacted the potentially affected users, disabled the applications on affected devices, and implemented changes in Verify Apps to protect all users. What is the scope of Chrysaor? Additionally, we are providing detailed technical information to help the security industry in our collective work against PHAs. 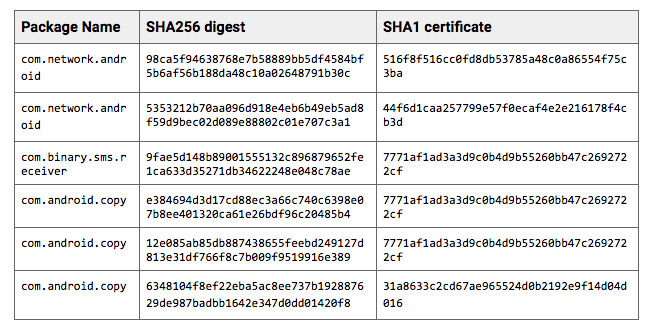 It is extremely unlikely you or someone you know was affected by Chrysaor malware. 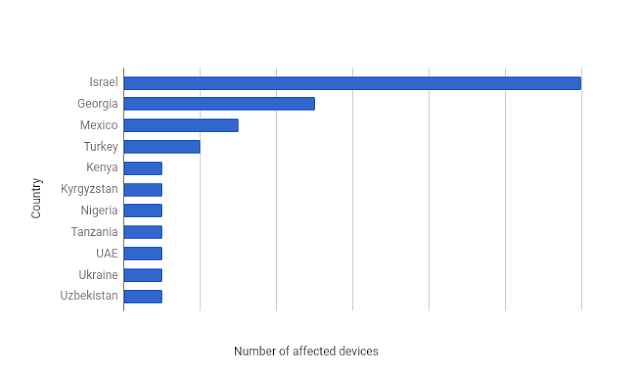 Through our investigation, we identified less than 3 dozen devices affected by Chrysaor, we have disabled Chrysaor on those devices, and we have notified users of all known affected devices. Additionally, the improvements we made to our protections have been enabled for all users of our security services. Install apps only from reputable sources: Install apps from a reputable source, such as Google Play. No Chrysaor apps were on Google Play. Update your device: Keep your device up-to-date with the latest security patches. Verify Apps: Ensure Verify Apps is enabled. Locate your device: Practice finding your device with Android Device Manager because you are far more likely to lose your device than install a PHA. To install Chrysaor, we believe an attacker coaxed specifically targeted individuals to download the malicious software onto their device. Once Chrysaor is installed, a remote operator is able to surveil the victim’s activities on the device and within the vicinity, leveraging microphone, camera, data collection, and logging and tracking application activities on communication apps such as phone and SMS. Upon installation, the app uses known framaroot exploits to escalate privileges and break Android’s application sandbox. If the targeted device is not vulnerable to these exploits, then the app attempts to use a superuser binary pre-positioned at /system/csk to elevate privileges. Deleting WAP push messages and changing WAP message settings, possibly for anti-forensic purpose. Starting content observers and the main task loop to receive remote commands and exfiltrate data. Repeated commands: use alarms to periodically repeat actions on the device to expose data, including gathering location data. Data collectors: dump all existing content on the device into a queue. Data collectors are used in conjunction with repeated commands to collect user data including, SMS settings, SMS messages, Call logs, Browser History, Calendar, Contacts, Emails, and messages from selected messaging apps, including WhatsApp, Twitter, Facebook, Kakoa, Viber, and Skype by making /data/data directories of the apps world readable. Content observers: use Android’s ContentObserver framework to gather changes in SMS, Calendar, Contacts, Cell info, Email, WhatsApp, Facebook, Twitter, Kakao, Viber, and Skype. Screenshots: captures an image of the current screen via the raw frame buffer. Keylogging: record input events by hooking IPCThreadState::Transact from /system/lib/libbinder.so, and intercepting android::parcel with the interface com.android.internal.view.IInputContext. RoomTap: silently answers a telephone call and stays connected in the background, allowing the caller to hear conversations within the range of the phone's microphone. If the user unlocks their device, they will see a black screen while the app drops the call, resets call settings and prepares for the user to interact with the device normally. Via an antidote file. If /sdcard/MemosForNotes was present on the device, the Chrysaor app removes itself from the device. To encourage further research in the security community, we’ve uploaded these sample Chrysaor apps to Virus Total. As a result of our investigation we have identified these additional Chrysaor-related apps. Lookout has completed their own independent analysis of the samples we acquired, their report can be viewed here.